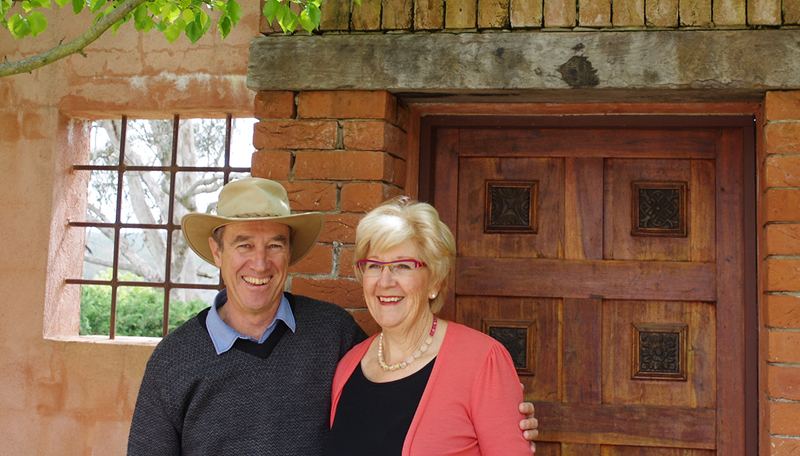 We developed a love of gardening from landscaping previous homes and, excited by the idea of developing a much larger garden in retirement, purchased a 3 acre property in the year 2000. A few obstacles like a very rocky block, a lack of water and the odd drought trimmed our grand plan, nevertheless we’ve developed just over an acre of garden and derived enormous pleasure watching mother nature paint our canvas. We’ve seen family and friends enjoy the seasons in our garden and they’ve encouraged us to share it more widely. Fortunately our daughter is a beautiful graphic designer and has made this possible. We hope you enjoy sharing our journey. Rob and Danice Duffield – that’s us. Rob grew up in Adelaide, South Australia, and developed his keen interest in building while working as a builder’s labourer during his uni holidays. I, on the other hand, am a country girl and grew up on a fruit and citrus property near Mildura. Working with my parents I learnt about gardening on the job. We’ve both developed a love of gardens and classical architecture, so really enjoy roaming through other peoples’ gardens. However throughout the development of Tour Rouge, although we regularly call on each other for help and advice, Rob’s been the builder and I’ve been the gardener. 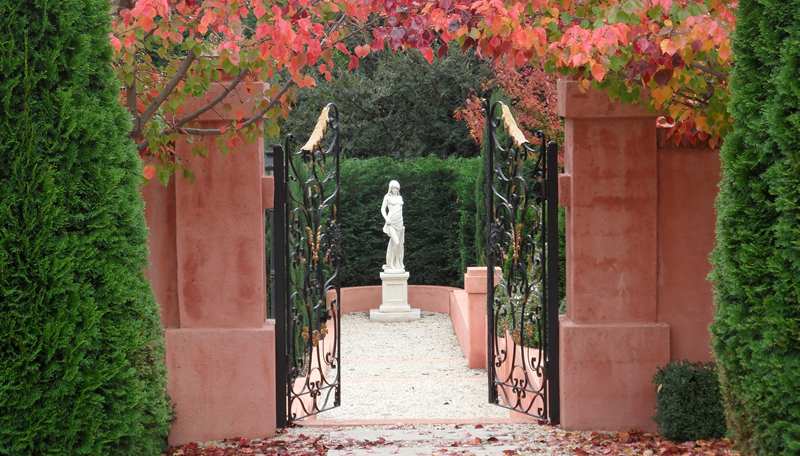 Since retiring we’ve travelled most years and often made garden visits a focus. 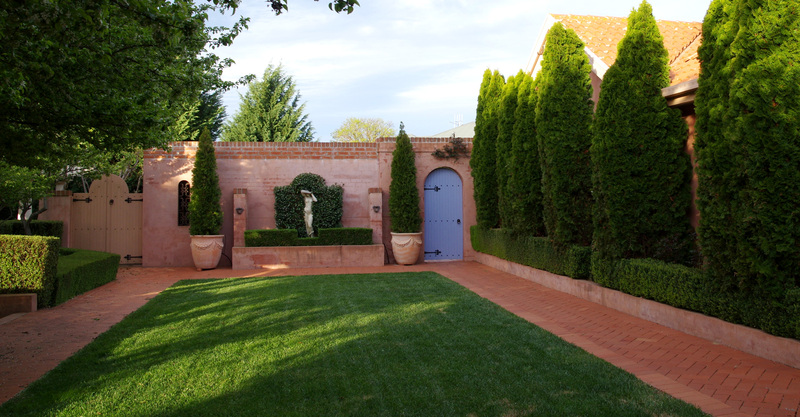 Early on we discovered that the gardens we enjoyed the most were a blend of plantings and strong architectural elements: a hedge, an axis, a garden wall, a statue, an arbour, a simple colour palette. 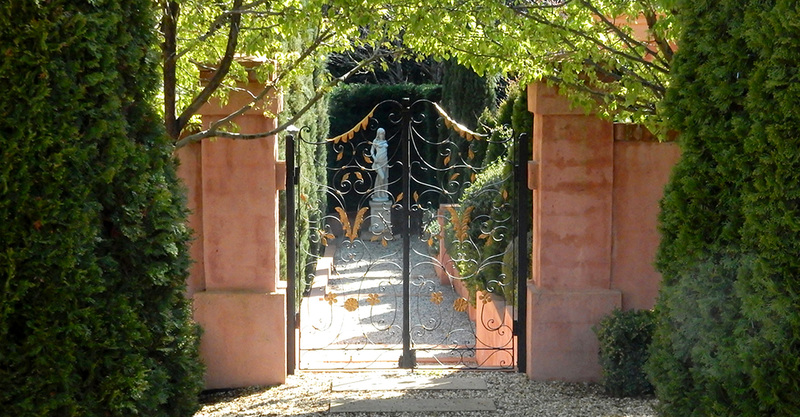 Many of our favourite gardens have stunning designs and surround beautiful buildings. We’ve taken numerous photos and tried to apply the simple principles on a very small scale in our own garden. 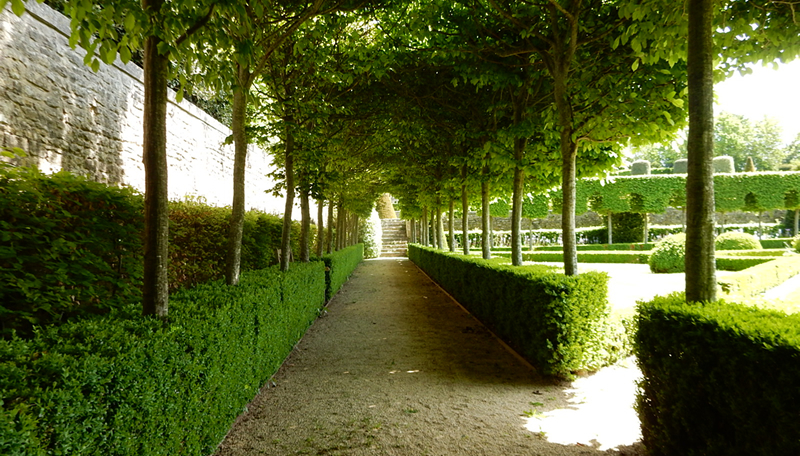 A favourite French garden is Château Brécy, Normandy (adjacent photo) and in Italy, La Foce, Tuscany. 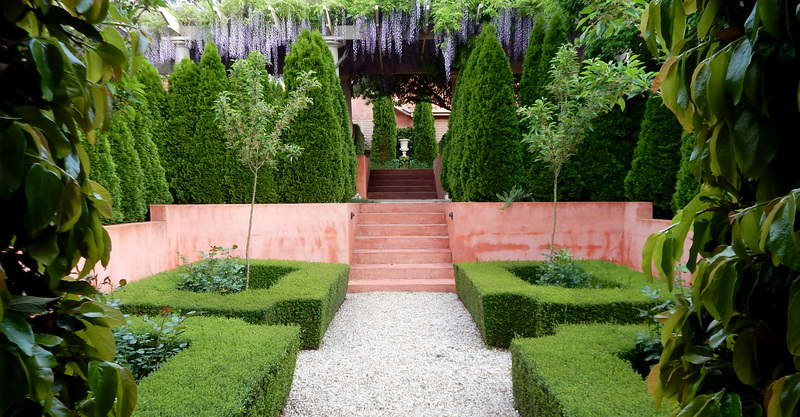 We’ve also been inspired by Australia’s own Paul Bangay and his garden books. As our garden has matured we’ve been asked by many if we started with a complete plan. In fact we began only with 3 very long pieces of string and marked out three main axes. 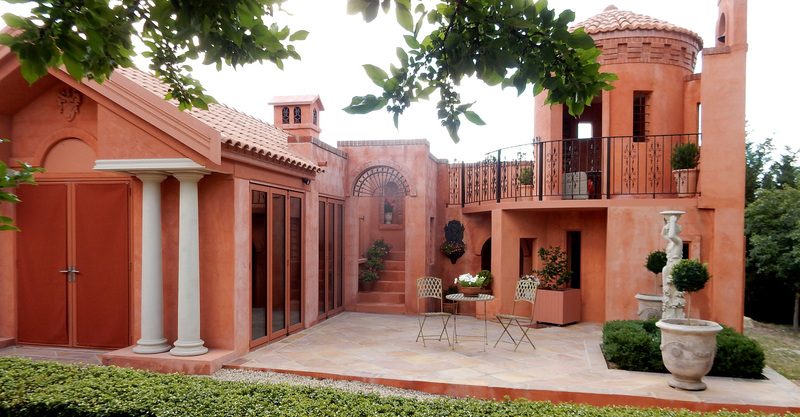 We ensured that those visual lines were maintained through the garden and “rooms” evolved within and around them. We’ve planted Leighton Greens to create tall hedges for privacy and wind breaks. 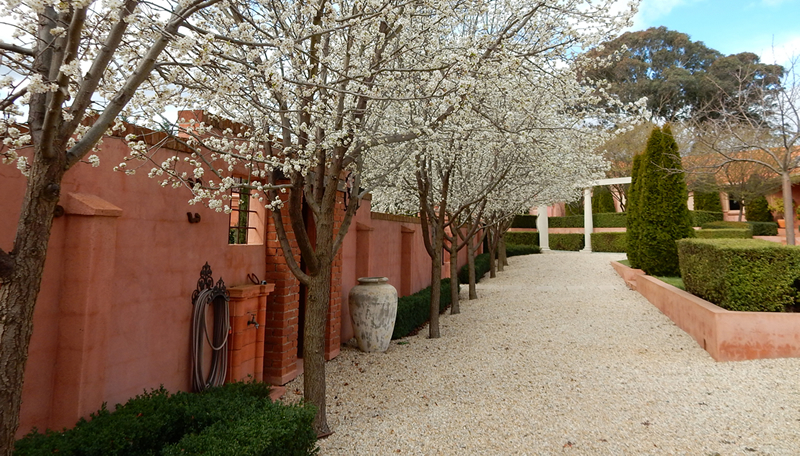 To outline our axes we’ve planted rows of trees including Pyrus Manchurian Pears and Westwoods, Italian pencil pines, Smaragds and Flowering Cherries. Hedging plants such as English Box, Lonicera Nitida and Pileata, Green Pillar Pittosporum and Princess of Wales roses also create strong lines. 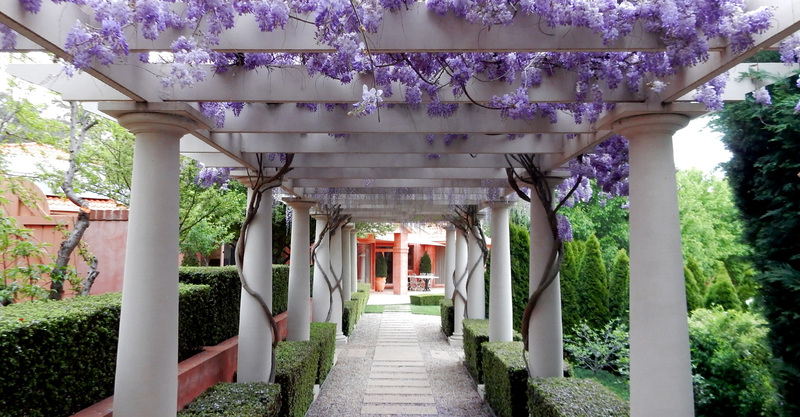 May bushes have been used to fill out garden beds and wisteria covers the arbour and several eyebrow pergolas. 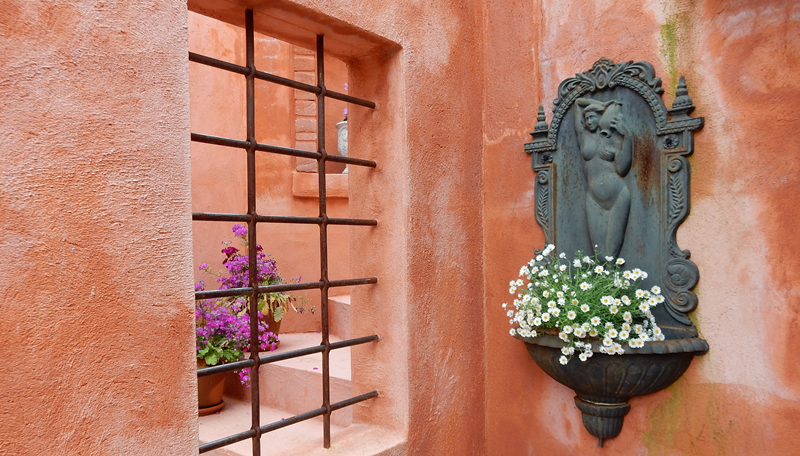 Along with plantings, rendered walls help maintain the lines of sight. We designed our house and then engaged a builder to complete the build. Every construction since then we’ve completed ourselves. The pump house, our first project, confirmed that we could build footings, lay bricks and render walls, build roof trusses and tile a roof. 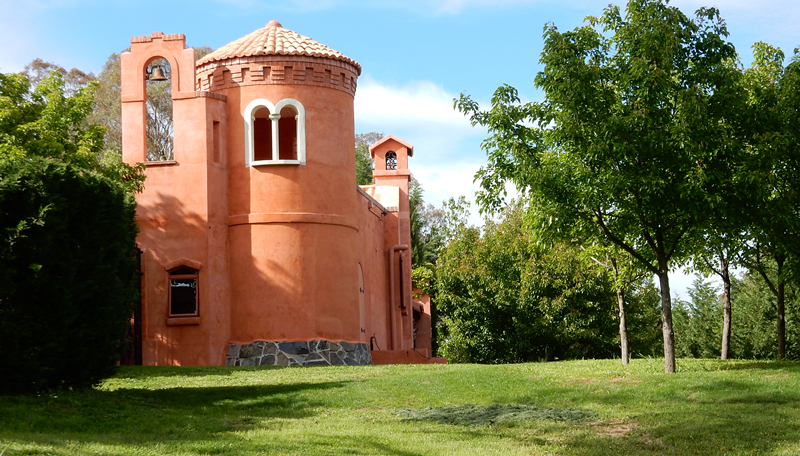 Since then we’ve built and sand-stoned two terraces, numerous retaining walls, a columned arbour, an archway and sunken garden, a courtyard, a loggia with kitchen, open fire, wood fired pizza oven and finally a two storey round tower with belfry. Each structure has provided an opportunity to imitate some enchanting feature we’ve seen on our travels. We love Italy and France for their history and culture. The architecture of their houses, churches, castles and palaces reflects the way people lived in much earlier times and when this is blended with a garden it becomes enchanting. Small architectural elements can catch the eye and complete a composition, so as we’ve travelled we’ve collected many of them photographically. We’ve seen each new construction in Tour Rouge as an opportunity to include some of these elements.